This trail is the only developed route into Wet Beaver Creek Canyon and the Wilderness Area it shelters. It is a very popular trail with hikers and anglers who come to enjoy the solitude and other rewards offered by a clear cool stream flowing through a scenic desert canyon. For the most part, the trail follows a route along a bench well above the streambed. A number of side trails, however, lead down to the waterside and indicate the location of good swimming holes or popular fishing spots. If you take advantage of these well-used detours, you'll find a number of places along the stream where deepwater holes alternate with bubbling riffles to invite you to take a dip or wet your line. 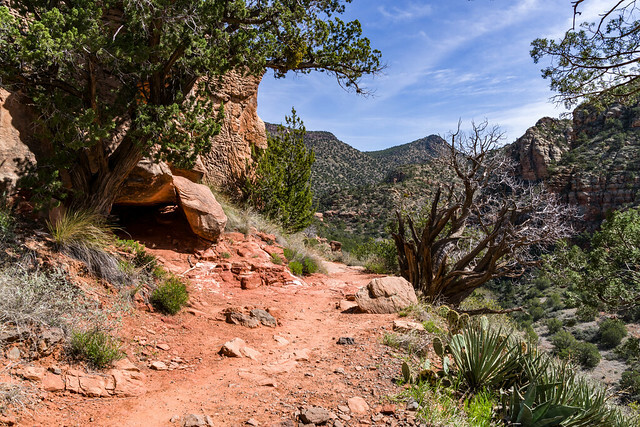 At one point the trail leaves the canyon bottom to wind high along an escarpment of red sandstone and offer scenic views of the riparian area, the canyon and the surrounding mountains and valleys. Most people who come to this trail hike only the first 3.3 miles to Bell Crossing, taking advantage of any one of several access paths that branch off the main trail and lead down to the stream. After crossing the Wet Beaver Creek, the Bell Trail climbs the canyon's south wall to a high, grassy plateau where it winds through pinyon juniper stands and open grasslands offering views that stretch all the way to the Sedona Red Rocks Country and the San Francisco Peaks. Eleven miles from the trailhead at Beaver Creek, Bell Trail ends at Forest Road 214. Location: 43 miles south of Flagstaff on paved and all-weather graveled roads. Access: Drive 40 miles south from Flagstaff on Interstate 17. Leave the interstate at the AZ 179 interchange. Turn east under the highway and drive about 1.5 miles east to the old Beaver Creek Ranger Station turnoff. Turn north about a quarter mile to the parking lot and trailhead. Click on the map thumbnail for a larger view. No motorized vehicles on trail. No mechanized vehicles in the Wilderness. The trail is poorly marked and hard to follow across the high plateau where there is also no water. The sign at the Bell Trailhead is correct in that we discourage trailers at this Trailhead. That is the reason we constructed the Bruce Brockett Trailhead (just north of the Bell Trailhead) for trailers and equestrian trailer parking and the trail from this trailhead connects to the Bell Trail. In the warm seasons, the first 3.5 miles of this trail (to the creek crossing) is very crowded with people accessing the creek.